In the year 2003, my life was changed with the release of the film, “Terminator 3: Rise of the Machines”. As if saving the world twice already wasn’t enough, Arnold Schwarzenegger came back to save humanity for the 3rd time and once again reminded us why we (or maybe just I) loved him so much. 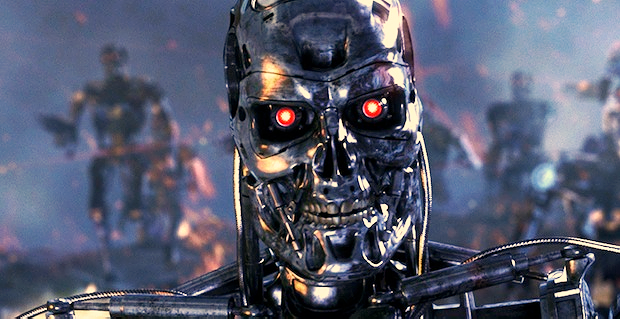 To this day, “Terminator 3: Rise of the Machines” remains my favorite movie of all time. And because I can’t share my love for the movie enough, I shall use it as an inspiration for today’s post. It is one of the eternal debates of mankind: free weights or machines? This question is right up there with BMW or Mercedes, Yankees or Red Sox, Germany or Brazil… oh wait, that one has already been settled. Basically there are two factions in the fitness world, entrenched in their beliefs and at war with each other. In the blue corner: the old school gang telling us that free weights are the way to go, and that machines are for sissies (“Arnold did not have any machines!”). In the red corner: the newcomers saying how machines are great to isolate, free weights are outdated, bodybuilder X only trains with machines… okay, maybe I’m being a bit too dramatic, but you get the point here. The truth lies in the middle, and so a mixture of machines and free weights will be your fast ticket to achieving your dream physique. When one starts working out, they should learn the big exercises first which includes: Squats, Incline Bench Presses, Bent-over Rows, Deadlifts, and Military Presses (Hint: hiring a qualified coach will definitely help you learn these the right way). Workouts should start with free weights since you are fresher and more focused, and use machines when performing drop sets, partial reps, static holds, or training on low carbs/low calories. Previous post: TO STRETCH OR NOT TO STRETCH?